Have you ever regretted recycling the Whatcom Watch prematurley because of an article you wanted to reread or share with someone? Never again! 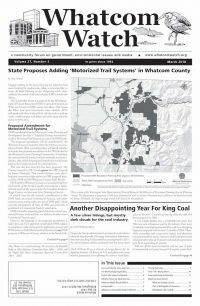 Whatcom Watch has gone digital and joined with Northwest Citizen (www.nwcitizen.com) to provide up-to-date and in-depth information on what is really happening in Whatcom County. Several months ago the paper began looking for an Internet host. Because the staff is all volunteer, and the modest advertising income is used to produce the paper, cost was a problem. John Servais generously offered to host our web presence at the Northwest Citizen website. The Northwest Citizen is an online community resource created by John Servais which covers local political news and opinions from a citizen’s point of view. “Whatom Watch Online” will include a full table of contents of that month’s current issue and a list of where complimentary copies are available. Articles will be available for reading, printing, or downloading (saving to a disk). Articles that have limited time value will not be included in the online version. Articles that are not at the website can be obtained at the Bellingham Public Library, where back-issues of this newspaper are available. Northwest Citizen and Whatcom Watch look forward to working together to provide local citizens with the news of what is really happening on political and ecological fronts in Whatcom County. Ken Russell was the Whatcom Watch online editor in 1998 and is the current online editor.